If you’ve been longing to own a Real Techniques Bold Metals makeup brush, well then I might have a solution for you. I managed to get my hands on most of the original Real Techniques Bold Metals collection brushes when they were on a 40% discount sale on Takealot.com last year. If not for the sale, I probably wouldn’t be able to do this comparison blog post for you. I was sent the Triangle Foundation Brush when Real Techniques first launched their Bold Metals brush collection in South Africa – and I reviewed that brush here. I have also already reviewed the Bold Metals Blush Brush and the Oval Shadow Brush in this blog post. There’s no doubt about it, the Bold Metals makeup brushes are exquisite – but that means they also come with a rather hefty price tag. Most people aren’t able to spend R2450,00 in order to own the entire Bold Metals makeup brush collection. I know I wouldn’t be able to just put R2,5k down in one go for something like that. Don’t get me wrong, I’m not saying these brushes are not worth the money (they are) but the fact is most people just don’t have the all that cash to spend on makeup brushes. Earlier in January I hopped onto eBay to do a bit of online browsing. I haven’t ordered anything off eBay for almost a year (mainly because in 2014 the post office drove me absolutely dotty) and so I decided to test the waters again. Here is a VERY detailed blog post on international online shopping that I wrote a while back – it’s called ‘Online Shopping 101 – How? What? When?’. I wanted to look for something special, but not too expensive in case the parcel got lost (which has happened to me more times than I care to remember). Since makeup and beauty is basically my life these days, I started thinking about what I would possibly want to get my hands on from overseas. I won’t take the risk buying any brand makeup on eBay, because I have heard (and read) terrifying stories about how counterfeit makeup products (i.e. fake Urban Decay palettes) have caused eye infections and allergic reactions because they contain toxic ingredients (yes, even cyanide). So, my next thought was…makeup brushes. Even though I already own enough makeup brushes to give an army of women a full makeover. As most of you already know, I’m very much into rose gold these days. Well, any type of metal actually… So in the eBay search bar I typed “metal makeup brushes” and THIS listing popped up (the seller still had stock when I last checked). Holy mackerel! R119,70 for a set of SEVEN Bold Metals dupe brushes? My flabber was gasted, and I immediately added the set to my cart. I thought it would be a good idea to do a comparison review for my readers, because R120,00 compared to R2500,00 is absolutely insane. I decided it was worth a try, so I paid the R119,70 plus R50,00 shipping and hoped the parcel would arrive safe and sound. I was expecting the brushes to only reach my local post office after 2 months (that’s how long I’ve had to wait in the past) BUT I’m very happy to report my parcel was in my post box (I didn’t have to collect it at the post office or pay any duties) within 3 weeks. It seems the post office has pulled their socks up! When I opened up the parcel I was quite impressed – all the brushes were super soft and fluffy. The bristles were neat (but not 100% perfect) and there was absolutely no shedded bristles in the package. Just like the original Real Techniques Bold Metals brushes, the bristles on the dupes are also synthetic (a bonus for my cruelty-free readers). ♥ Unlike the original Real Techniques Bold Metals brushes, the dupe set doesn’t have ‘RT’ printed on one side and the brush number on the other. 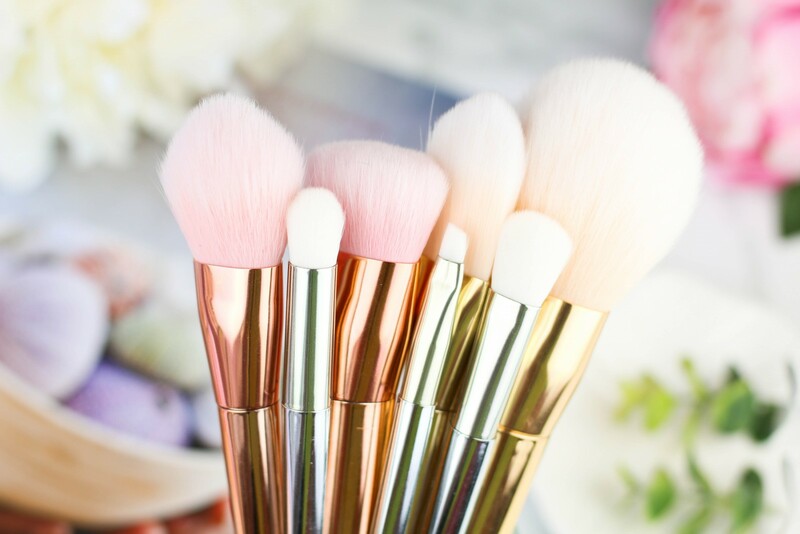 ♥ The dupe brushes aren’t weighted at the bottom, so they don’t feel as heavy and luxurious. The tapered shape of the ferrules and handles are the same for the most part, but some of the dupes’ ferrules are less ‘pinched’ at the top. They are still very nice to hold, though, and fit well in your hand. ♥ The dupe brushes aren’t made as well as the originals i.e. the ferrule and the handle are not attached as evenly, and some have tiny gaps where they meet. They are glued together quite well, though, and I haven’t had any handles come loose. ♥ The ferrules on the silver brushes are a bit less shiny than the handles, but it’s not a very noticeable difference. ♥ The gold eBay brushes have a more yellow gold look to them, whereas the original Real Techniques brushes look more like a muted silvery gold. I prefer the originals, they just look more classy and luxurious. ♥ The dupe brush bristles are less dense that their original counterparts but they are very, very soft. The original Real Techniques brushes are just a teeny tiny bit softer, but most people wouldn’t even notice the difference. ♥ The shape of some of the dupe brushes are slightly different than the originals, but we’ll get into that below when I’ll compare each brush seperately. 100 Arched Powder Brush ♥ Both brushes look similar in shape, but the real RT brush has a bit more of a yellow ombre going on towards the base of the bristles. In terms of density of the bristles, the dupe brush is definitely less dense, plus the bristles aren’t as precisely cut. Because of this, the dupe brush is not as soft as the original. The ferrule on the original brush is a lot more pinched, and because of this I feel like the bristles will last a lot longer without shedding compared to the dupe. With regards to application of powder products, I definitely prefer the original because it picks up more product and applies it more evenly. 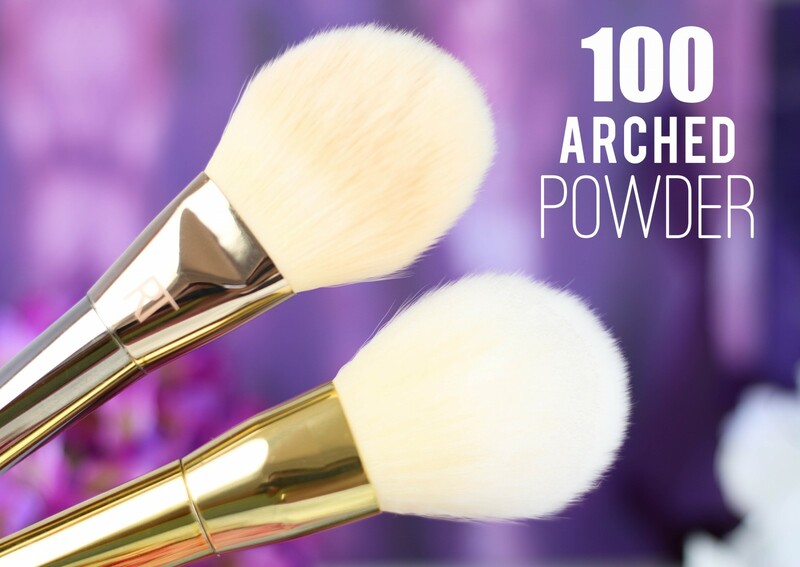 It’s not a major difference, and I imagine most people won’t even notice this if they don’t own the original Real Techniques 100 Arched Powder Brush. Wash / dry / shape? I’ve washed all the brushes 3 times in the last month, I’ve owned the originals for about 6 months now and so I’ve washed them a lot more times. Although there wasn’t much shedding with the dupe brush, I did notice it doesn’t hold its shape as well as the original. Again, it’s not a massive difference and you can fix this by using brush guards (you can buy them from Swiitch Beauty, a South African online store). BUT I imagine if you don’t use a brush guard, then the bristles will start to look very messy within a few months. 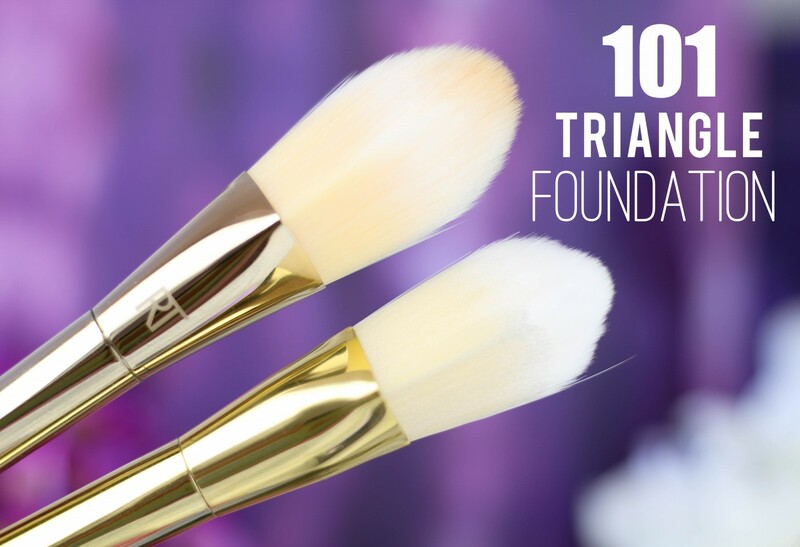 101 Triangle Foundation Brush ♥ I reviewed the original brush in this blog post, and I wasn’t the biggest fan to start off with (I just don’t like these flat paddle type brushes). The dupe brush looks the same in terms of shape (it’s just a teeny tiny bit smaller) but the most noticeable difference is the bristles. The bristles are not cut as precisely (you can see in the above photo) and there are a couple of longer bristles sticking out on either side of the brush. Both brushes feel the same in terms of the texture of the bristles, but the original one is a lot more dense than the dupe. Wash / dry / shape? I must admit, I’ve only washed the dupe brush twice so far because I hardly ever use it. I only ever use it to apply my cream / clay face masks. The dupe brush shed a couple of hairs after the first wash, and then again after the second wash but it isn’t anything to be too concerned about. The bristles on the Triangle Foundation Brush (both original and dupe) are a bit different to the other brushes, they’re more synthetic / plastic-y and so they hold their shape really well. 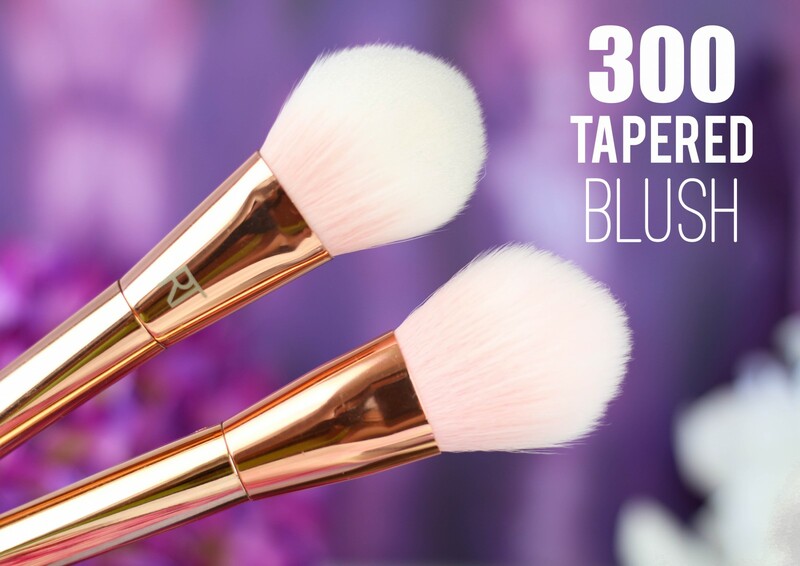 300 Tapered Blush Brush ♥ Both brushes are VERY similar in shape but the difference comes when you look really closely at the bristles. The bristles on the original are perfectly cut at the ends, but some of the ends of the bristles on the dupe are a bit curly (they curl back towards the handle). Both brushes feel very soft on the skin, but the original is just that little bit softer and more dense. That means it picks up more product and blends it out more effortlessly. I reviewed the original Real Techniques Bold Metals 300 Tapered Blush Brush in this blog post. Wash / dry / shape? The original Real Techniques 300 Tapered Blush Brush washes and rinses easier and holds its shape a lot better than the dupe. I own brush guards, and that’s why my dupe brushes still look good. You can try to shape the bristles while they’re drying, but if you don’t use brush guards over a long period of time, then the bristles on the dupe will start to look quit scraggly and messy. I find I don’t need to use brush guards on the original Real Techniques brushes at all, they hold their shape really well. 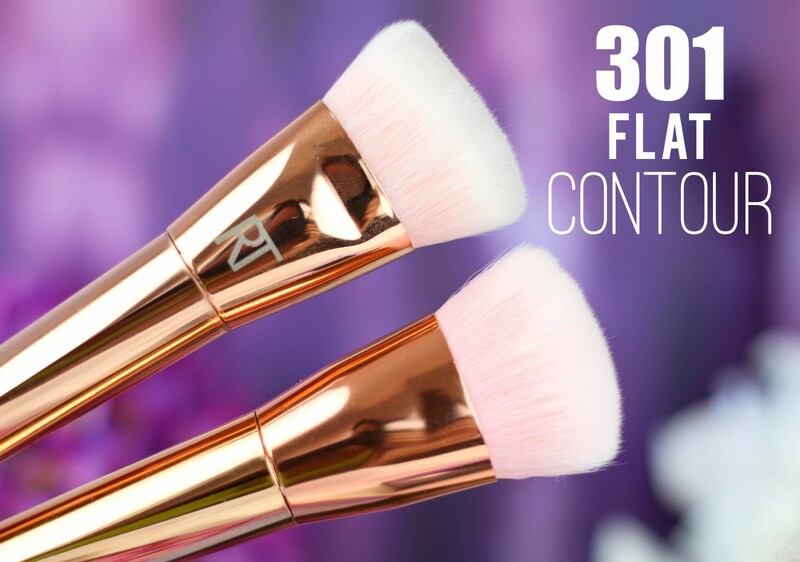 301 Flat Contour Brush ♥ I love this brush so much! Well, I actually love both but for different reasons… The original brush is extremely dense, and so it’s perfect for really sculpting out the face with a cream contour or powder contour product. It applies an even layer of product and blends it out to an airbrushed finish. The dupe brush bristles are less dense, and so I find it’s perfect for bronzing up the perimeters of the face or applying a sheer layer of contour product for a natural look. It also blends cream or powder products out really well, but I actually prefer to use with powder products. As you can see in the above photo, the original brush is shaped a lot better and looks more flat at the top. The dupe brush is not as precisely cut and almost looks a bit convex in shape. I’ve also found a couple of black bristles in the dupe version, which isn’t a huge issue but it’s just not as perfect as the original. Wash / dry / shape? The dupe brush dries a little bit faster than the original, but that’s only because the bristles are less dense. The biggest difference, though, is that the original brush holds its shape so much better than the dupe brush after a brush bath. Again, you would need to use a brush guard after washing the dupe brush, otherwise you might end up with a brush that resembles Einstein’s hair after a few more washes. 200 Oval Shadow Brush ♥ Both brushes look very similar in shape, but the bristles on the original are just a tiny bit shorter and more dense. Another difference is that the bristles on the original have a grey-ish ombre at the base, whereas the bristles on the dupe brush are white from top to bottom. I actually think the bristles on the dupe are cut more precisely than on the original, but it’s not very noticeable. The original brush is more dense, and so it packs on more eyeshadow and blends it out a bit easier as well. Both brushes feel very soft to the touch, and I can’t really tell if one feels softer than the other. 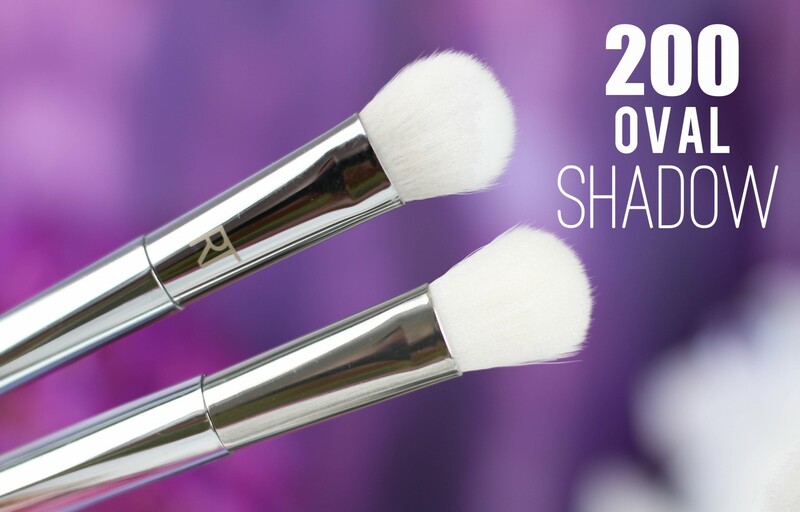 I reviewed the original Real Techniques 200 Oval Shadow Brush in this blog post. Wash / dry / shape? Both brushes wash and dry exactly the same, both still feel very soft and both hold their shape really well. 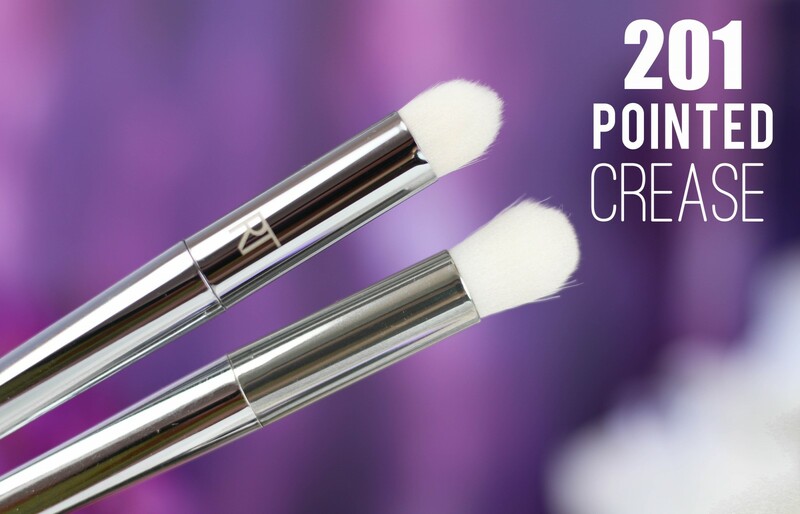 201 Pointed Crease Brush ♥ These brushes are VERY different, the shape of the original is bullet-shaped whereas the dupe brush looks like a smaller / rounder version of the aforementioned 200 Oval Shadow Brush. It almost feels wrong to compare the 2 brushes because they are so different in shape. Anyway, the original brush bristles are more densely packed than the dupe and so it applies more colour. The original brush is best used to apply cream or powder eyeshadows to the lower lash line or eyelid area, whereas the dupe brush can be used to apply cream or powder shadows to the lower lash line, eyelids or to blend a shade into the crease. The original is just too short and dense to blend anything in the crease, and so I think the dupe version is more of an all-rounder brush. Wash / dry / shape? Both brushes wash and dry really well, but because the bristles on the original RT brush is a lot more dense, it dries a little bit slower. But the original brush holds its shape better than the fluffier dupe brush. Again, these 2 brushes are completely different, so I don’t think it’s fair to compare the two to each other. 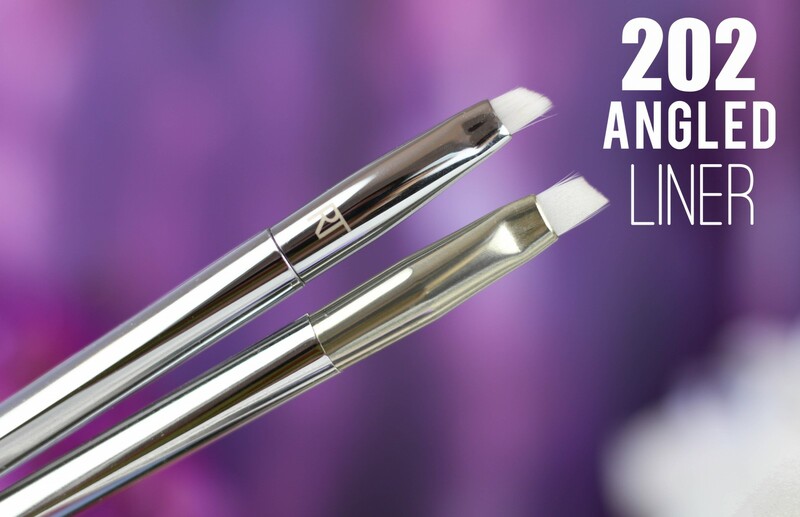 202 Angled Liner Brush ♥ These 2 brushes are also quite different in size and shape. The original brush is smaller and more precise, whereas the bristles on the dupe brush are a bit less densely packed and they are longer as well. I think for applying eyeliner, I definitely prefer the precision of the original Real Techniques 202 Angled Liner Brush. The dupe brush bristles is just a bit too flimsy, and I struggle to get a straight sharp line when using it. However, the dupe brush is quite nice for creating a natural brow look with a brow powder because it doesn’t deposit as much product. Wash / dry / shape? Both brushes wash and dry very well, but I think in the long run the original brush will hold its shape for longer because the bristles are so short and dense. I haven’t experienced any shedding on either brushes so far. For hygiene reasons I washed the brushes before I first used them, I do this with all my makeup brushes because well…you never know where they’ve been. All the brushes wash and dry well with little to no shedding after washing them. I have noticed that the dupe brushes tend to absorb product (powder / cream) a lot more, and so they don’t transfer colour as well as the original Real Techniques Bold Metals brushes. The dupe brushes that are less dense than their original counterparts also don’t pick up as much product as I’m used to, plus sometimes it feels like some of the cream and powder products get stuck in the bristles. Please note: There are a number of eBay sellers that sell these Bold Metals brush dupes, and from doing some research, I can tell you that some are better quality than others. Some sellers have sets that actually have the ‘RT’ printed on the ferrule / handle BUT those don’t really look like proper dupes because the ferrules and handles are different shades of metal (on all the brushes). Other sellers have complete sets that are just one colour i.e. all the brushes are silver, gold, or rose gold. I’ve also read that some of the brushes (with the printed RT) break much easier, and their handles are quite loose as well. The set I bought from this eBay seller is relatively good quality – the handles feel sturdy, the ferrules & handles are not two-toned (except for a slight difference in the silver brushes) and so far the bristles still feel as soft as the very first time I used them. When I compare dupes to originals, often times the main difference between the two is my experience with the products while I’m using them. 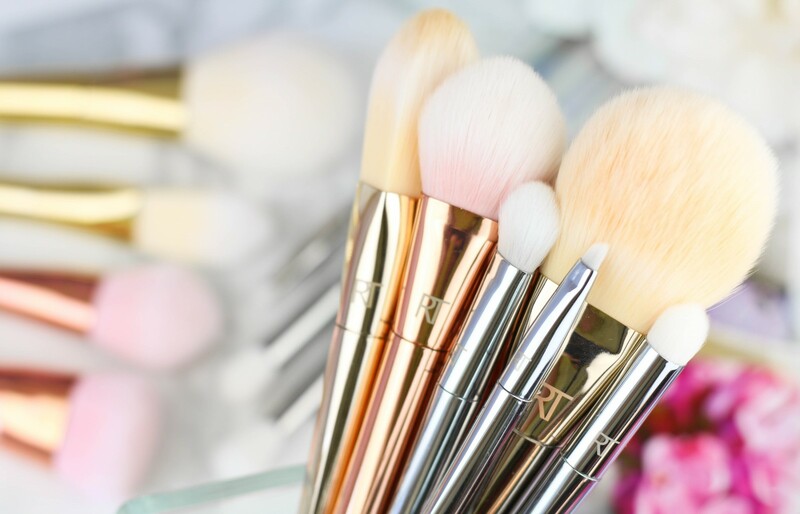 Sometimes more expensive makeup products and makeup brushes make your makeup application process easier, more pleasant, and with less effort. And comparing the original Bold Metals brushes to the eBay dupes confirmed that for me once again – the original brushes blend products out so much quicker and more effortlessly, they don’t absorb as much product, most of the original brushes are a lot more precise in terms of shape and application, and last but not least they don’t lose their shape after washing. I am convinced the original brushes will last me A LOT longer than their dupe counterparts, but at the end of the day you need to ask yourself: Would you rather pay R120,00 to have 75% of the experience and maybe replace the brushes 6 months or a year down the line. Or would you rather invest in a select few of the original Real Techniques Bold Metals brushes and know that you probably won’t have to replace them for a very long time. Are these eBay brushes dupes for the original Bold Metals brushes from Real Techniques? No. There’s no denying the brushes are similar, but I don’t think they are 100% duplicates. 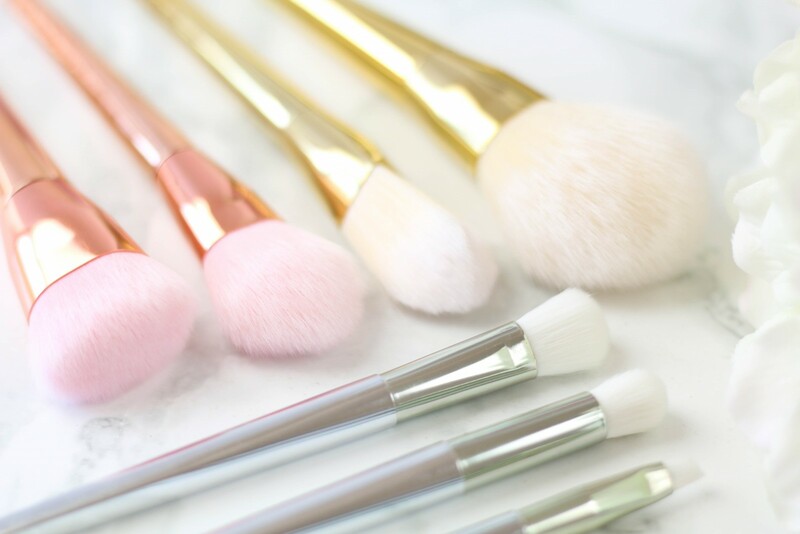 Are these eBay brushes worth their R120,00 price tag? Absolutely, I would even pay R400,00 for the set! I’m very happy with the quality of the brushes – if you add the shipping fee to the price, you are basically paying R24,00 per brush. That’s insane! If you do feel comfortable ordering off eBay, then I highly recommend these. Bear in mind, though, even though I received my parcel within 3 weeks, there’s no guarantee you will also receive yours in under a month. You are, however, able to request a refund if your parcel is lost or stolen – no harm, no foul. The eBay seller I bought my makeup brushes from has a very LONG list of makeup brushes, and I’m keen to place another order soon. There are even dupes for Sigma Beauty, other Real Techniques, and even the NARS Ita brush (but I can’t comment on the quality of those brushes). If for some reason the seller I bought from is out of stock by the time you read this blog post, just type “metal makeup brush” in the eBay search bar. You’ll find a long list of sellers, then sort by ‘Price + Shipping: Lowest First’ and you’ll be good to go! Or you can wait until my eBay seller has the set back in stock again. So…what do you think? Based on my review, do YOU think the brushes are dupes for the original Real Techniques Bold Metals brushes? Thanks for a great in depth review. I really enjoyed reading it as I feel you were quite neutral and not bias. This allowed me to easily make an independent decision whether I should stick to the original or the dupes. I agree – R2450 is a lot of money. I’m so glad you mentioned that you’d rather save up to purchase the originals, that’s exactly why I wrote the blog post…to give you guys an affordable option, but still make it clear that I don’t think these are true dupes. I’m so happy you told us about this seller, I’ve already ordered the dupes and definitely going to be purchasing more, thanks so much! Hi Luzanne! I love your posts, always so lengthy and informative…I am about to jump under my skin about these brushes!!! Question: What type of packaging were yours in? Coz I see a whole lot of different yet similar brushes with different names and pricing. I really don’t want to kick the hornet’s nest, but I think the line between dupe and fake is blurry here. Sure these don’t have the RT logo on them, but the design was blatantly copied. I don’t find any info on the brushes being patented etc, but I’d imagine these are infringing on copyright laws. These are just the thoughts I had while reading this – I’m not trying to make trouble. Hi Leigh-Ann, a dupe is a duplicate of something. I prefer to not use the word ‘fake’ because I don’t like the word, to me it sounds harsh. It’s like the word ‘cheap’, I prefer using the word ‘affordable’ to describe something. For me, dupes are affordable alternatives to luxury products. These might look the same, but in my opinion, they aren’t the same. I wrote this blog post to introduce my readers to a more affordable option. At the end of the day it’s still their decision whether they want to purchase the brushes or not. If these are infringing on copyright laws, then I’m sure Real Techniques would have issued some type of press release to the public, or would have taken it up with eBay to ask the sellers to remove the products. Thanks for replying. I don’t know where you find the time to respond to everyone. I also wouldn’t spend the £30 they cost here at the moment but these are so close to the original it makes me wonder how they get away with it. Your photos are gorgeous!! Im going to buy myself and my bestie a set of these. Thank you for this blog post, Luzanne. I think theyre good dupes, even though some of the brushes dont look or feel exactly the same. Id much rather spend R200 on seven brushes, than R2500. Just love how indepth your reviews are, thank you. I just bought a set from ebay, can’t wait for it to arrive!!! You’re welcome, Patricia. 😀 I hope your set arrives safe and sound (soon!). Loved this blog post, you are so my favourite blogger! thank you for always introducing us to new things, I didn’t even know brush guards existed!! 😀 That eBay store should pay you royalties hehe! Thank you so much for the amazing compliment, Yvonne. I think they are dupes, and I am definitely going to place an order. Can’t believe they are only R120 for the set. WOW! Lots of people would love the original Real Techniques brushes but can not afford them but now thanks to you we can get something similar to the real deal. I went last night to check them out on eBay and they’re sold out — booooo! Your photos are stunning in this post Luzanne, I love the purple!! I totally agree, I’ve heard some of the goat hair brushes you buy on eBay are extremely scratchy. 🙁 I don’t think I’ll ever take the chance on makeup brushes from eBay unless the bristles are all synthetic. Thank-you for reviewing these brushes! Great post! I might buy this set just for the eyeshadow brushes. I don’t really own any semi-descent ones because I apply eyeshadow maybe once a month! So no justifying buying RT or other expensive brushes. I do have to say I love my RT Expert Face brush which I use daily! Thank you for reviewing these brushes . I have to admit at R120 they are a steal . I may order it just to test the waters with the dupes but I’m definately into quality so I may save up even if it’s just to own a few of the originals … I have seen some South Africans on instagram selling dupes of makeup and brushes albeit at R500 plus courier charges and I wondered about quality. great post as always .. This is an amazingly detailed blog post review, thank you so much for all the work you put into this! I just purchased my first RT brushes (the regular ones, not the metals) and am SO happy with them. I ordered them on a website called Biovea and they were a good discounted price, and worth every cent. Thanks again for all your effort! It’s a huge pleasure, Vivella. 😀 I agree, the original RT brushes are LOVELY! The blush brush, powder brush and the buffing brush are definitely my favourites. 🙂 BIOVEA has great prices, but I had such a bad experience with my last order a couple of weeks ago…not sure I’ll order from them again for a while. Thanks so much for sharing this post, i walk past the bold metals brushes in Clicks all the time and with that price tag i look at them with a sad face and slowly walk away… so as soon as i read your post, i jumped for joy and ordered the set on ebay. I really was expecting you to be completely biased and this was one of the best reviews I have ever read. THANK YOU! Wow, what an awesome review. In depth with loads of valuable information. Thank you for always posting interesting content with the prettiest pics. I LOVE LOVE YOUR BLOG, just wanted to ask u if you know why theprices of RT brushes has doubled on Biovea? I was too tired of clicks and foschini and clicks always running out, I’m a new collector, I’m damn near obsessed with the core set in recently got and i searched till I found your blog with a list of alternative south african suppliers, I went to Biovea put stuff on my basket, 11 pieces including the starter kit was about 1400 next day I check to try check out, it was almost 3k, so I just wanted to ask if u knew anything about that? Do they have specials or what? I also bought me these brushes after reading this review! Thankfully I received it after 3 weeks, but I struggle with contouring! I have watched countless youtube videos and tutorials,I have used powder and cream and even the pencils and tubes form La Girl, i just dont know what i am doing wrong! I thought it would be easier once I get a contouring brush but no……. curios to know if you have tried the Carli Bybel Palette? I ordered mine from BH Cosmetics about 3 weeks ago and I am counting the minutes till I receive it! I want to purchase the original RT Bold Metals collection as I just feel that they are a better investment for the long term despite this being a lot more expensive. Please can you tell me when (approximate month) you brought yours on takealot with the discount as the brushes are a bit more pricey now. I’ve been looking online at amazon and ulta for discounts too… I will have to buy them over time as I can’t spend more than R2500 on brushes at once. Thanks for the post! After I realized the handles on my Real Techniques brushes are made from plastic with also the paint chipping off I didn’t see a point for the high price anymore. The quality doesn’t meet the price. Realtechniques.com avoided answering my question about the brush handles material and ignored the fact that I told them the paint is chipping off. Those who got nothing to hide, hide nothing. I gladly ordered some dupes. The materials were listed as nylon and plastic – no difference to the Real thing. Other than huge price difference!! Do they ship to Scotland?